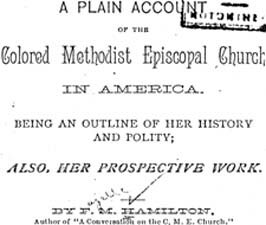 F. M. Hamilton (Fayette Montgomery), 1858-1912 A Plain Account of the Colored Methodist Episcopal Church in America. Being an Outline of Her History and Polity; Also, Her Prospective Work. Nashville: Southern Methodist Publishing House, 1887. Methodist Center, Drew University, Madison, NJ provided the text for the electronic publication of this title.